It is certainly something very special to give! The certificate can be general, loaded with a credit in any amount to be used in any of prime Forever Dancing services,or it can be descriptive where it does not show the amount loaded but specific number of Private Lessons, Group Classes or simply Specials. Check for payment instructions below. Gift Certificate Suggestions:For New students, first time only. You can give one of Forever Dancing Introductory Special. It makes the best way to for starters. 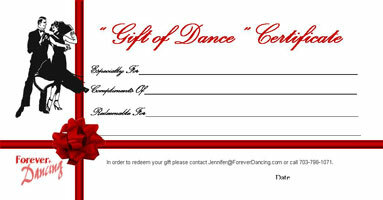 Gift any amount certificates for a specific dollar amount can be purchased. by calling our studio at 703-824-3555 for purchase. To schedule your Private Lessons send an email to Jennifer@ForeverDancing.com and provide your information with the redeemable amount and availability to coordinate with one of our instructors. No Refunds, Exchange or credits will be processed after purchase. You will receive the gift certificate by e-mail after payment has been completed.